Pete Telszewski won the Webb's AC match. After several weeks out of action Peter Telszewski returned to the fray in fine style in the Webb’s AC club match fished at Kingsland Fishery. While several anglers relied on the feeder, Telszewski opted for a pole and pellet approach, but crucially fished a prawn on the hook to make sure he attracted the bigger fish. It worked out well as he finished well clear of the field putting 81lb 11oz to the scales. Second was Alan Forrest with 48lb 7oz, then came John Brodie on 37lb 14oz. The Over 55s match on the Willow Pool saw Dave Rowell put a cracking 137lb 13oz to the scales from hot peg 25. Runner-up from peg 29 was Mick King with 115lb 11oz, and third from peg one was Vince Hull with 109lb 4oz. At long last it looks as if the carp at Haddon Lodge have woken up. Unfortunately many were hooked and lost, but matchwinner Lucio Melillo Junior managed to get a few in along with skimmers and small silvers fishing the feeder and pole to weigh in a level 30lb. 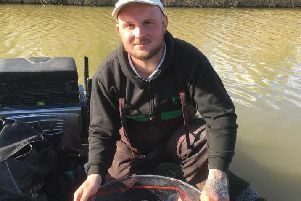 Martin Harwood fished pellet on the pole for 20lb 13oz, followed by George Bates on 20lb 10oz. Conservative Club anglers fished the Jay Lake at Pidley on Saturday and top rod with 113lb 6oz from peg 47 was Ian Bradshaw. He caught on pellet fished shallow on the pole. A couple of pegs away was John Newman. He fished red maggot on the pole to finish with 66lb 2oz. Then it was John Hudson, who caught on luncheon meat fished on a short pole line for 33lb 4oz. A lower than usual turnout for the latest JVAC match on the Willows at Decoy on Sunday saw the match spread over the whole lake giving the majority of those fishing plenty of room. That turned out to be an open invitation to bag up. Top rod was the in-form Lee Kendal. He drew peg 35 and fished a chopped worm and caster approach netting carp to double figures to finish with a fine 153lb 6oz. In second place from peg 11 fishing close in on cat meat was Chris Saunders then came Mick King fishing chopped worm and caster from peg five, weighing in 146lb. There seems to be very little anglers can do right now to stop Stan Dow making the frame at Float Fish Farm Fishery. On Saturday he notched up yet another win, this time with a huge 133lb. He caught fishing on a feeder over to the island, but caught the majority of his catch close in on the pole with meat. In second place with 86lb was Alan Wiggins, who caught on paste, then came young Harry Murphy in third place with 75lb.